If you missed this weekend, Patrick can take you down river, www.blackwateroutdoors.com . It hasn't stopped raining all weekend. It must've been time for Cheat Fest. Cheat Fest isn't a celebration of adultery or tax evaders; no, it's namesake is the Cheat River. 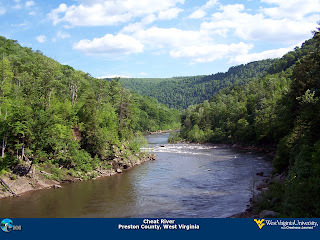 Now, the Cheat River may get its name from the filthy-dirty gamblers ritually drowned in her waters? Who knows? Just as we did last year, the HypnoVessel sent a dingy (yes, the Director manned the booth, and yes, I enjoy the pun) to the festivities. We suffered, one (1) dead car battery, ran out of cream, sugar, and coffee filters, and the Director lost sixteen thousand eight hundred and forty-nine (16,849) brain cells. After the mud settled, Chip (of Whitegrass fame) jumped the Rover, and the Director made his way safely back to the mountain... we broke even. A very appreciative tip of the hat to Jared and Moriah for helping the Director whilst "in country", Chip for the jump, Gary (to a larger extent Mountain Made) for the loan of the super-easy gazebo tent, Willie and Mike for the keg of H2O, to all of the patrons who bellied up to the HypnoDingy, and of course to the Director himself for serving the mast yet one (1) more time! If you have any photos appropriate for sharing via the blog, send 'em my way.